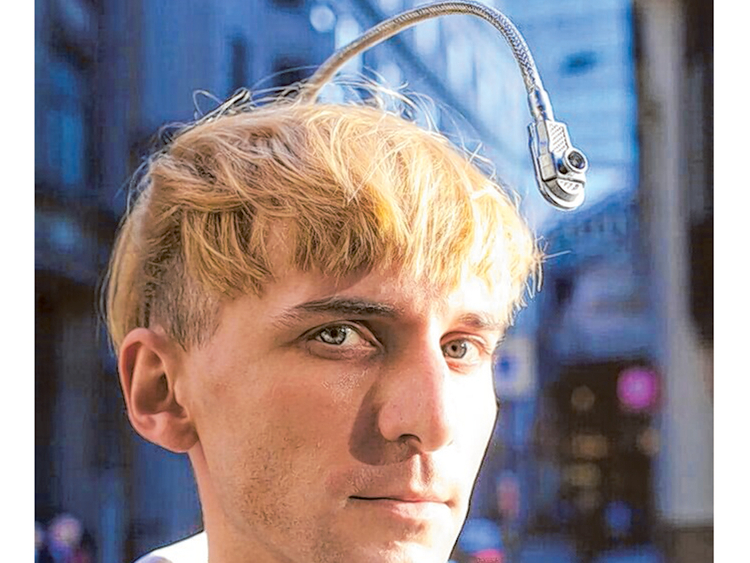 Dubai: Meet Neil Harbisson, known as the first person in the world with an antenna implanted in his skull. Harbisson, a Catalan-raised, British-born cyborg artist, explained how the antenna in his head has helped him cope with colour blindness. “I have an antenna that is implanted inside my head, which allows me to extend my perception of reality beyond the visual spectrum. I can sense infrared and ultraviolet, and I also have internet connection in my head that allows me to receive colours from other parts of the world, or connect to satellite so I can send colours from space,” he said. Harbisson, who was in Dubai to attend the World Government Summit, was recognised as the world’s first cyborg in 2004, and has since become the co-founder of the Cyborg Foundation – an international organisation that defends cyborg rights, promotes cyborg art and supports people who want to become cyborgs. His wifi-enabled antenna sends vibrations in his skull to report information to him, such as electromagnetic radiation, videos or images which are translated into audible vibrations. “I see this as a body part, not a device, but as an organ. And I don’t wear an antenna, I have an antenna. So I see this as part of me,” he said. Click here for more on the World Government Summit 2018.